You can exercise your right to make your own healthcare decisions, even when you are unconscious or too ill to make them yourself, by using a health care power of attorney. This is important to consider because your loved ones may not know which treatments you’d prefer when there are multiple treatments available with varying risks. 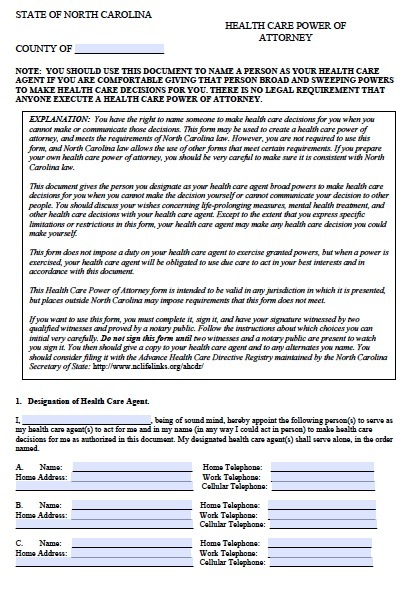 The typical form grants a sweeping range of authority to your agent, such as the right to request and review any of your medical information, employing or discharging any medical providers, consenting to the use of medications, consenting to or refusing any procedure or treatment that healthcare personnel authorize, and discontinuing life-sustaining measures. You can specifically limit the agent’s power by indicating, for example, that you do not want the agent to have the right to discontinue artificial hydration or nutrition. In another section, you may also specify certain treatments that you do not want under any circumstances.